Hello! I have SUCH blog guilt. I took a few weeks off from my two blogs while my semester wrapped at Southwestern. I finished up my three classes (and all their papers and finals), started a job, and moved out of my apartment and back home with my family. This weekend my brother flew home from college in DC. This is really the first summer I am home from university. Previously, I went to community college and worked, and hadn’t moved out of my parents’ house yet. Last year, I stayed on campus to take summer classes and write. So now, I am home and our family of four is all together. Weird. So far, so good. Only 8 panic attacks, and I’ve spent 3/5 nights at my friend Rose’s house while she’s out of town! Ha. I’m joking. It was 2 panic attacks. Having my brother home has been AMAZING. He is two years younger than I am, and we so close. We are the best of best friends. The running joke is that we’re twins (this also works when he orders a beer but doesn’t have an ID- my twin sister has hers, and she’s 22!). We say the same things at the same time, and make the same jokes to cashiers which makes it seem like we rehearse jokes about cupcakes or mother’s day gifts ahead of time… But I am loving it. 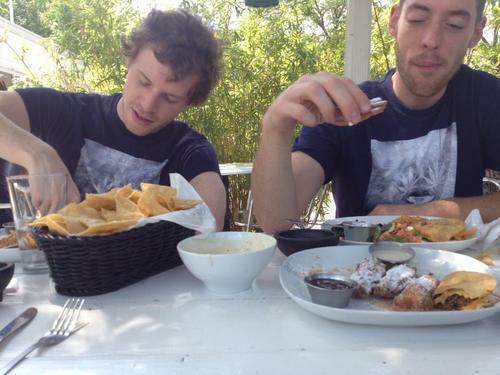 One funny thing about having Tom home is that Tom and Scott own a lot of the same clothes. Sometimes I even own the same shirt, too. So they’ll dress alike, and I get excited and also want to put on my Gnarnia BMX tee or my Empire tank top. But they say two people dressing the same is cool, while three makes us look like we’re all in a cult or we’re on a class trip. Here the twins are yesterday, out for a day of adventuring in the same shirt! At Zocalo’s Tex Mex in Austin. I had churros for lunch. Like, so good. I really regretted it after my run later, when I was shaking. Haha. Cheers!